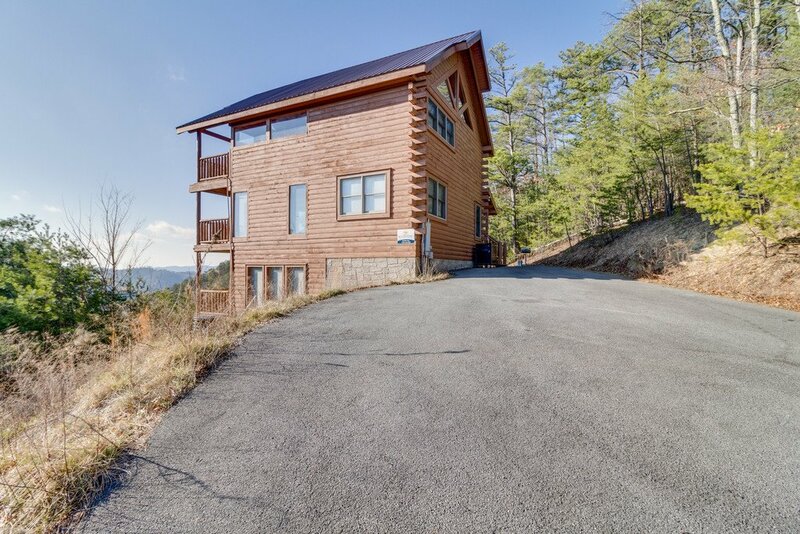 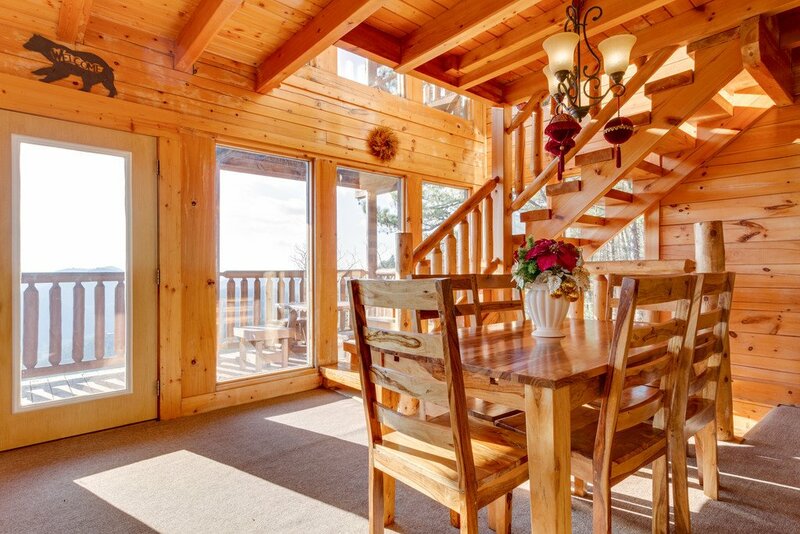 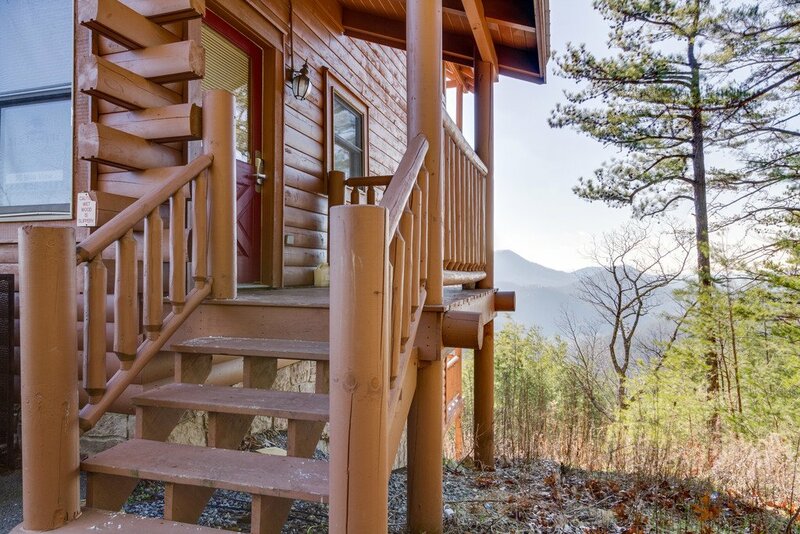 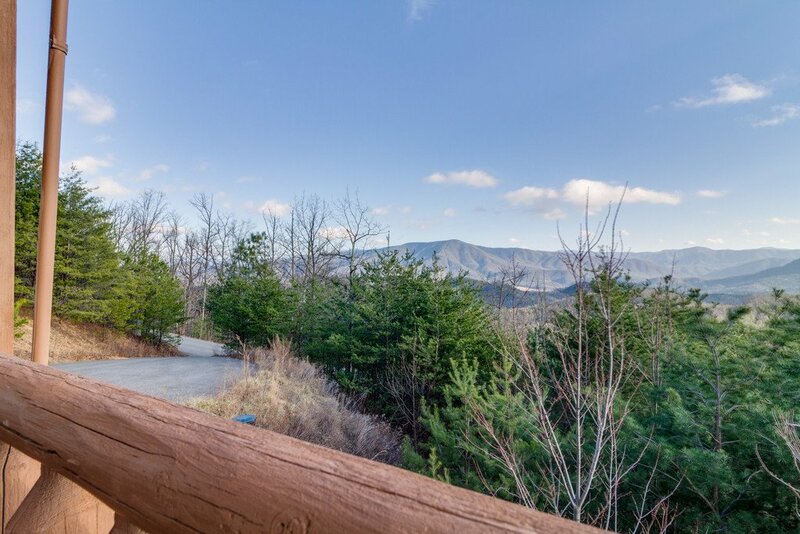 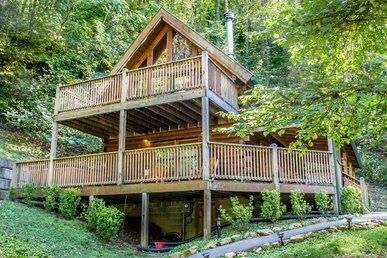 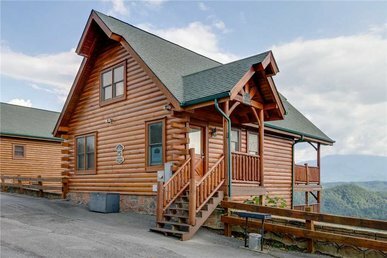 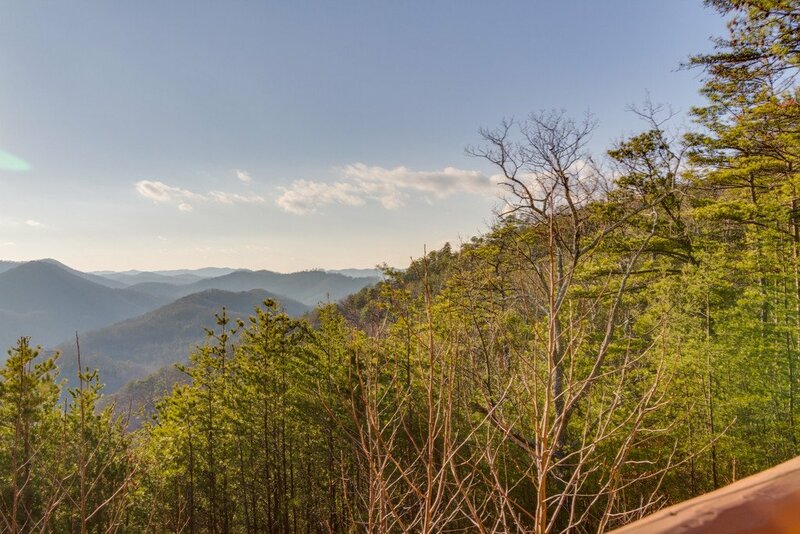 50 Mile View is settled high above overlooking Wears Valley in the Wolverton Mountain community where you can enjoy the serene side of the Smokies but still be within close proximity to all the area has to offer. 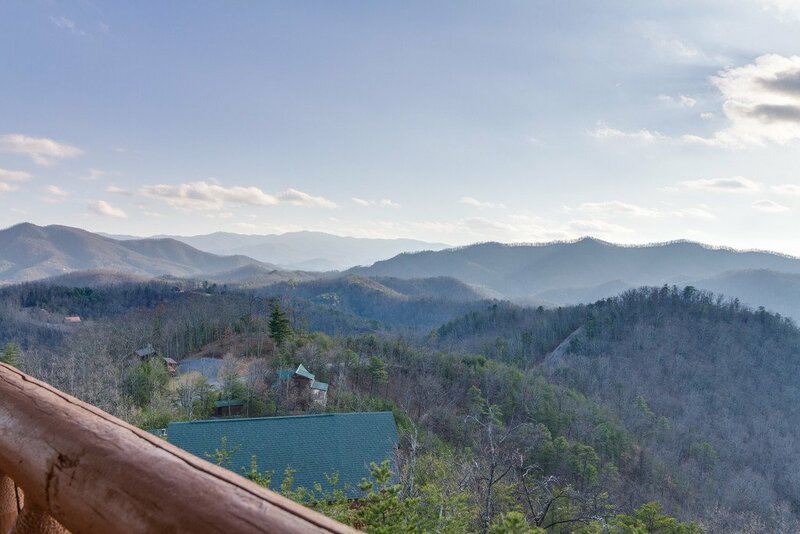 Being at some of the highest elevations of any resort in the gives you an astounding vantage point like no other! 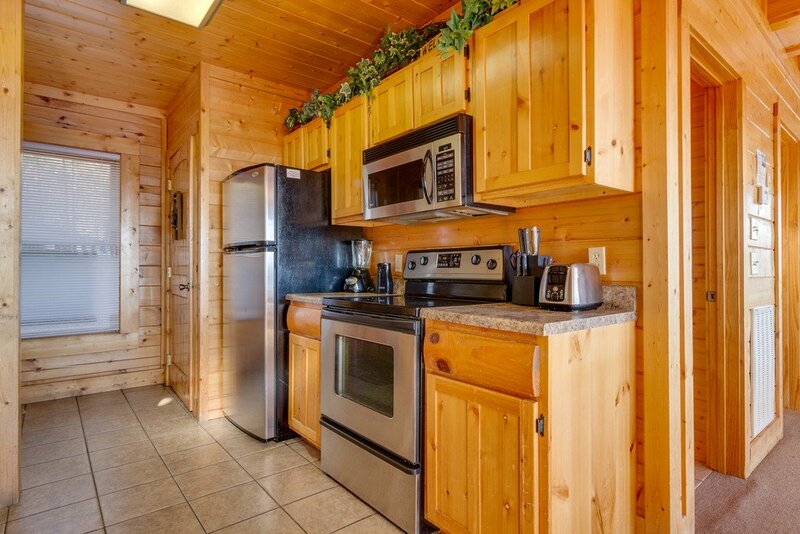 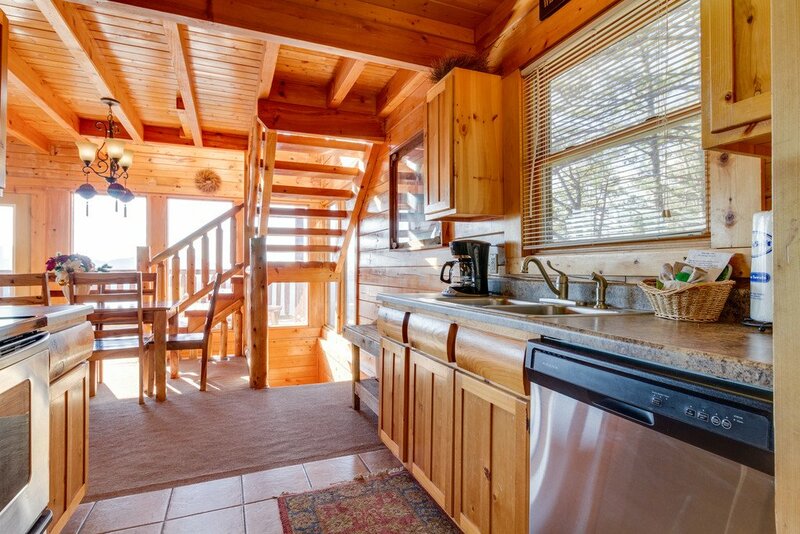 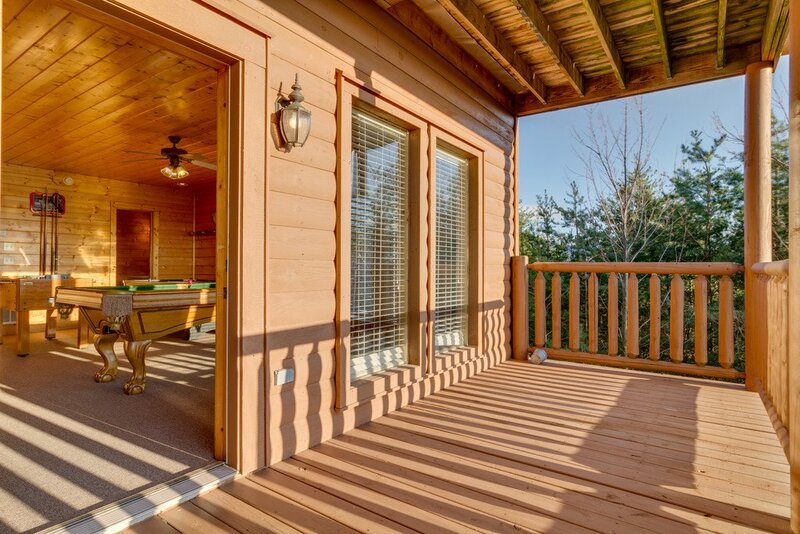 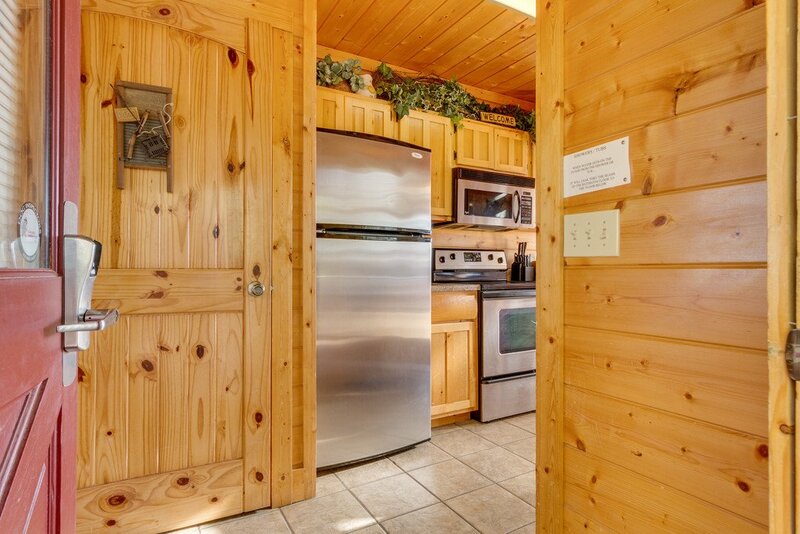 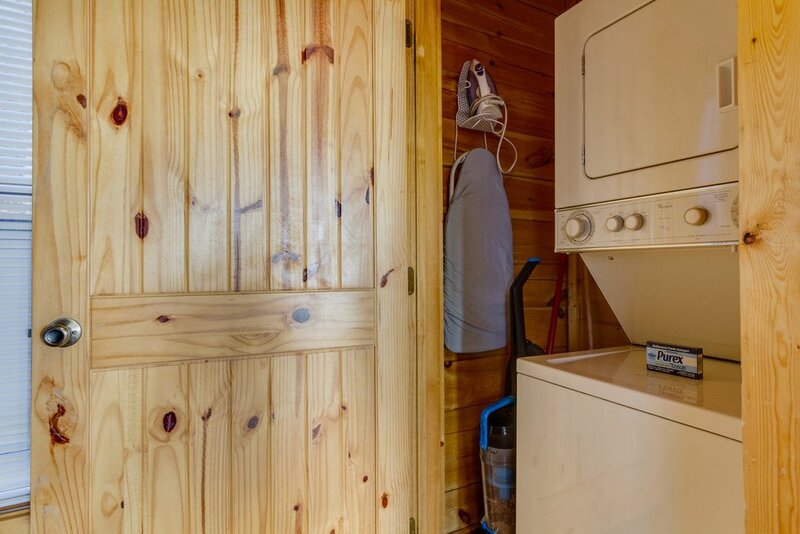 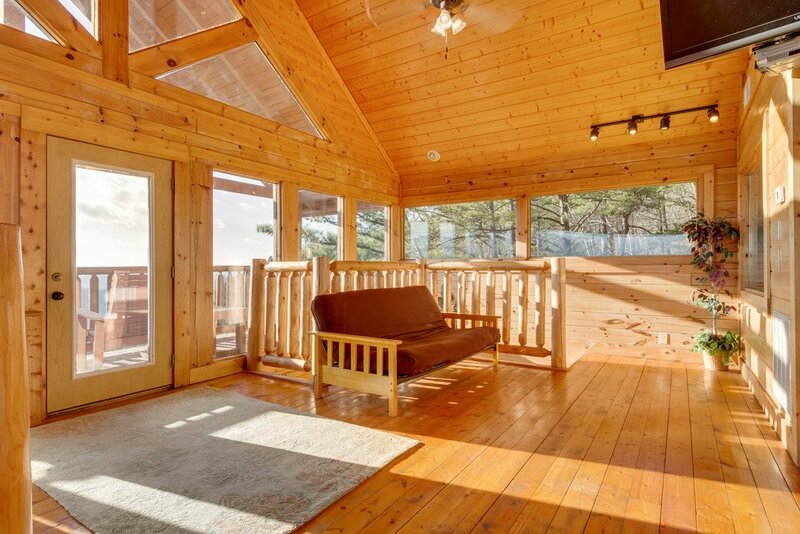 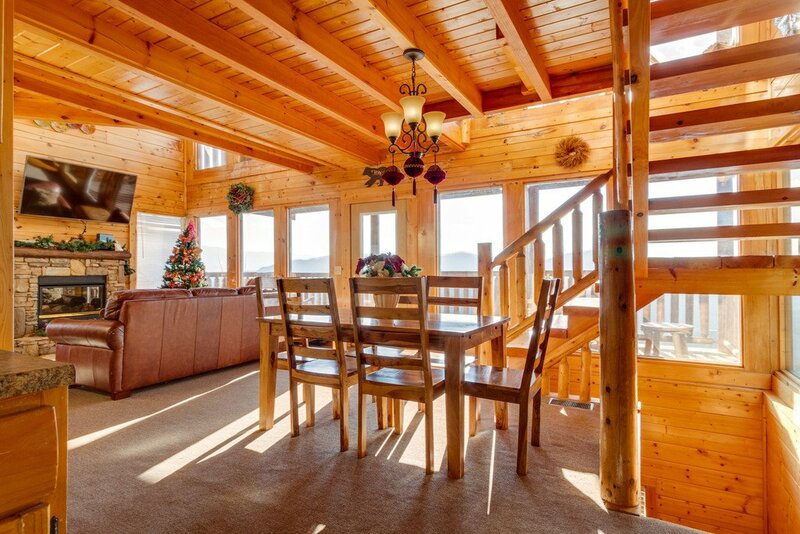 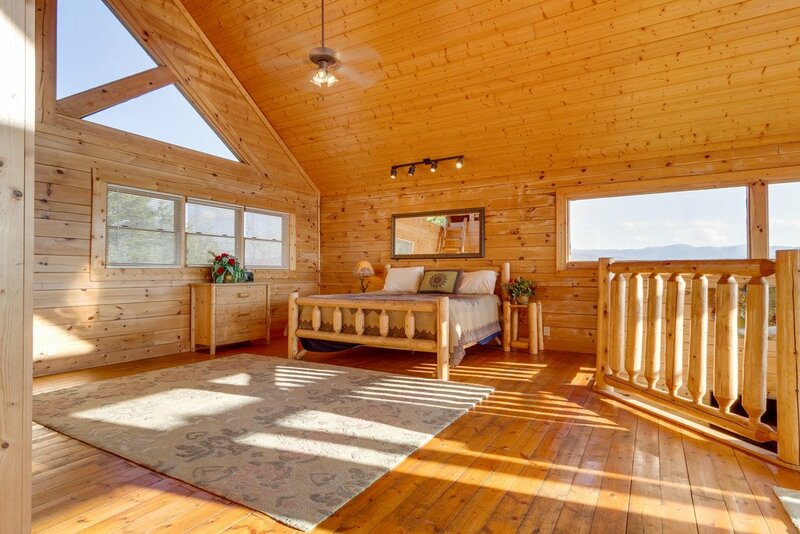 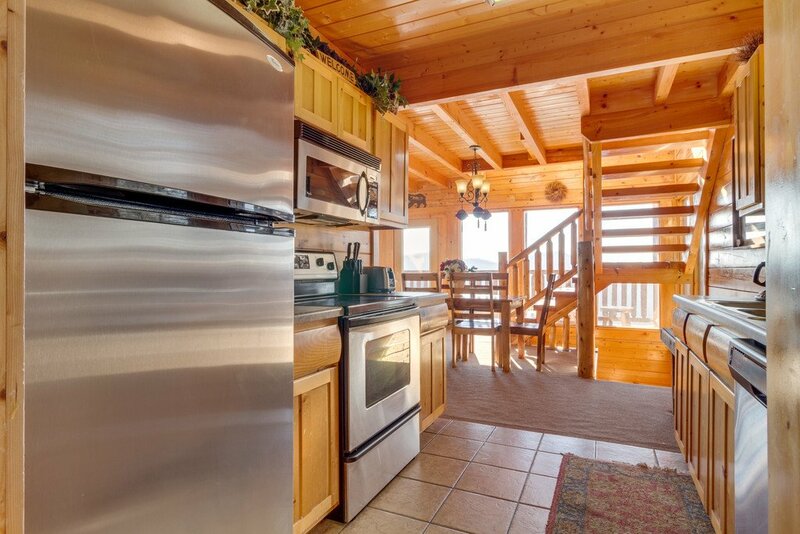 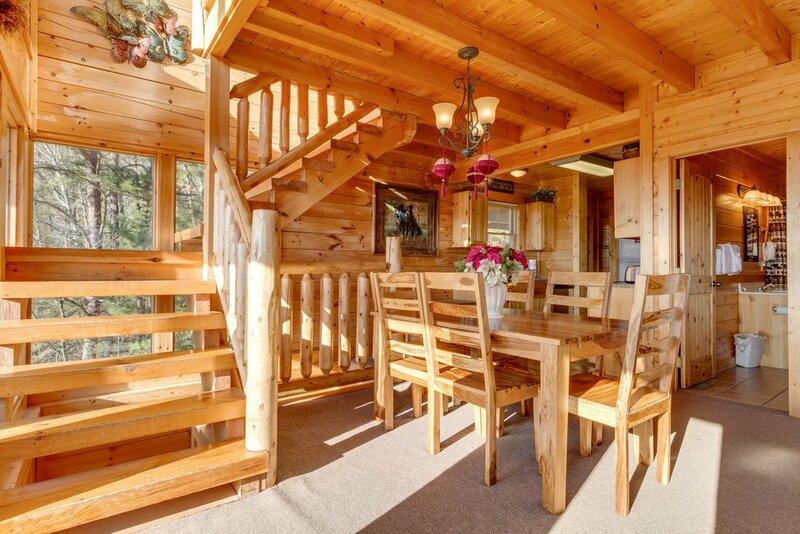 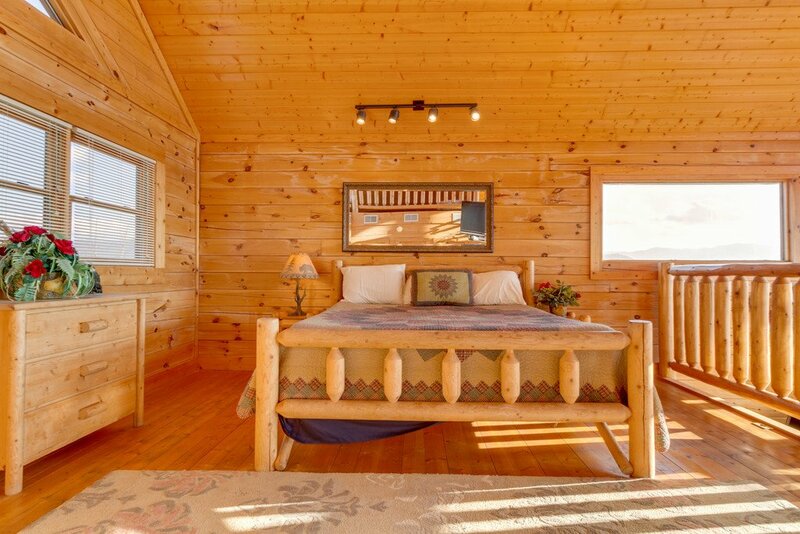 This cabin has two bedrooms and three bathrooms, as well as additional sleeping options on each of the three floors. 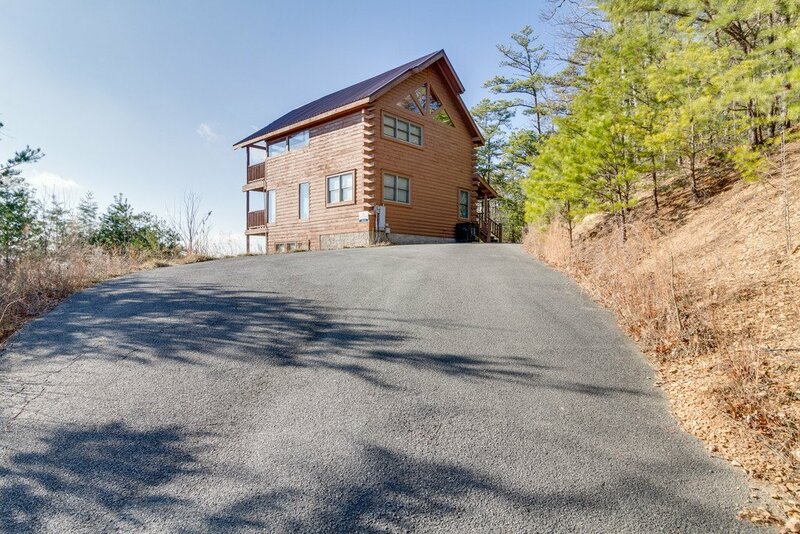 50 Mile View sleeps up to 18 people with a king in the master-loft area, a king in the main level bedroom, a queen sleeper sofa in the living room and several futons throughout the home. 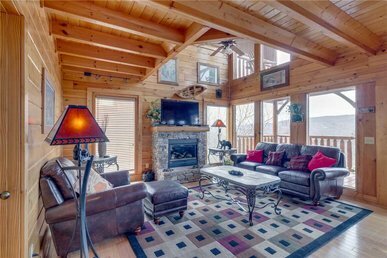 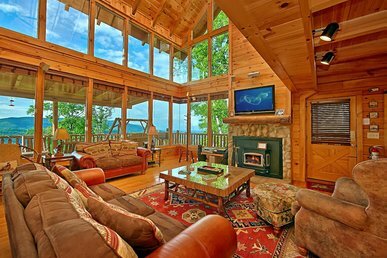 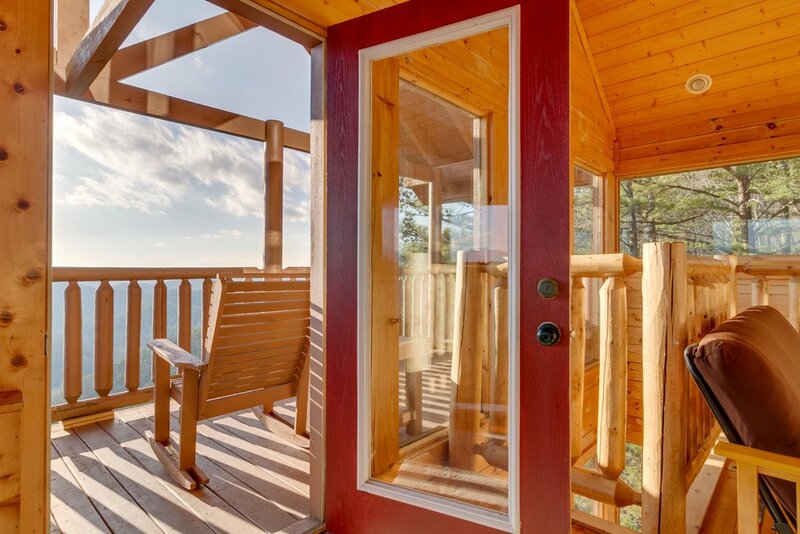 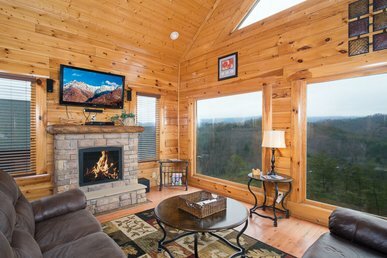 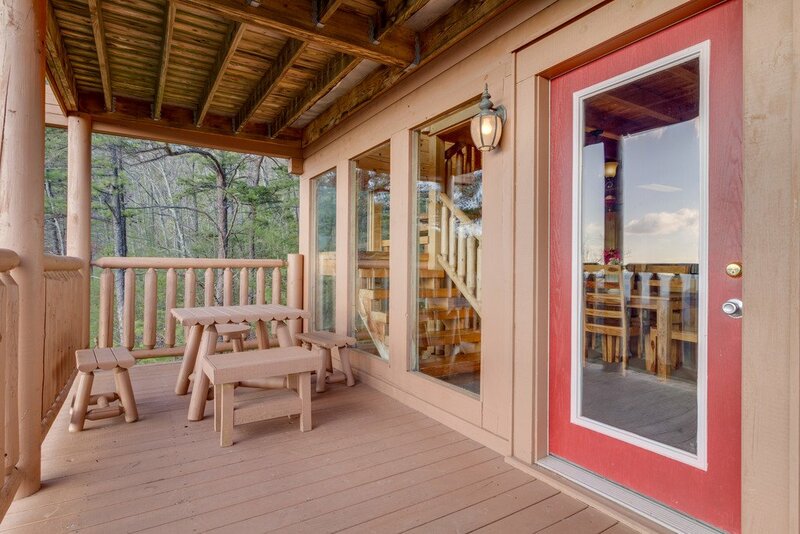 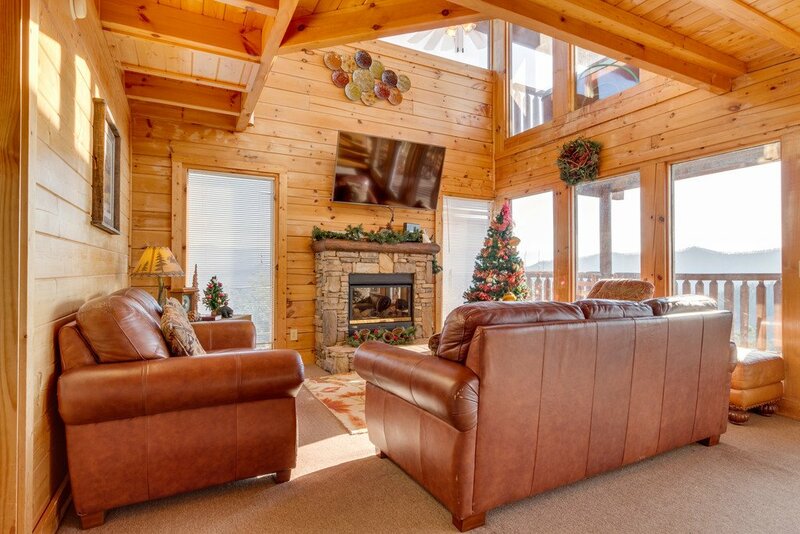 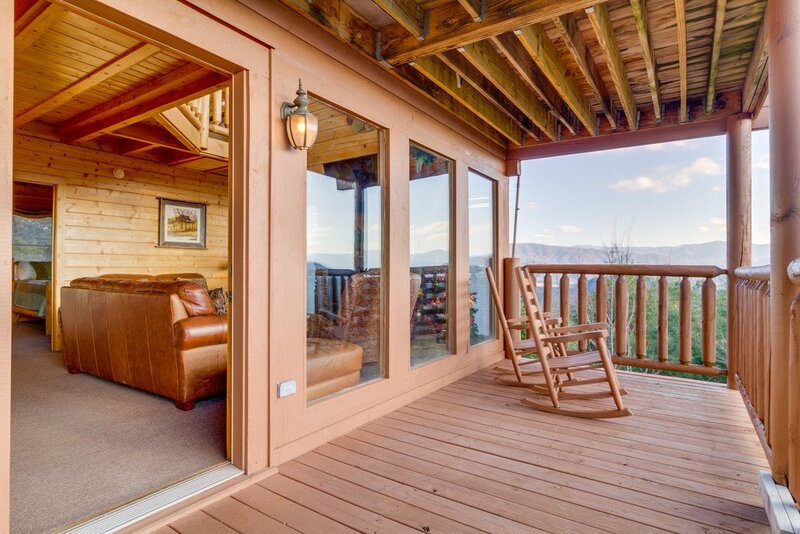 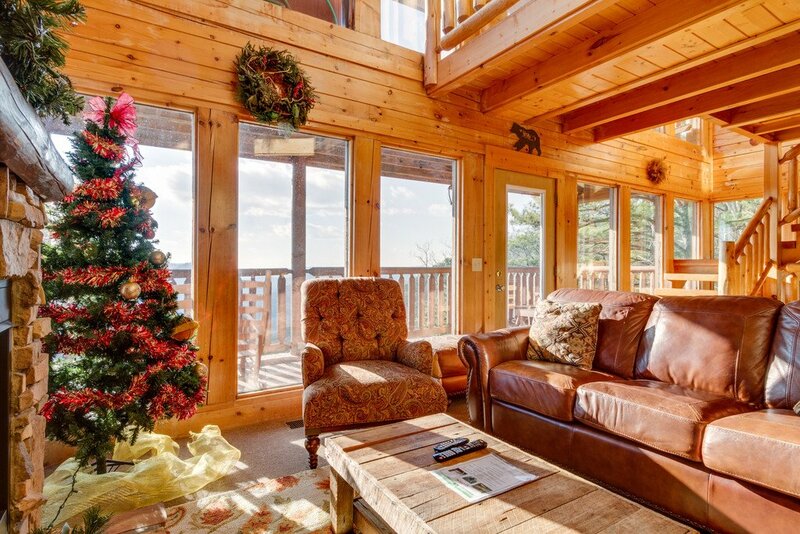 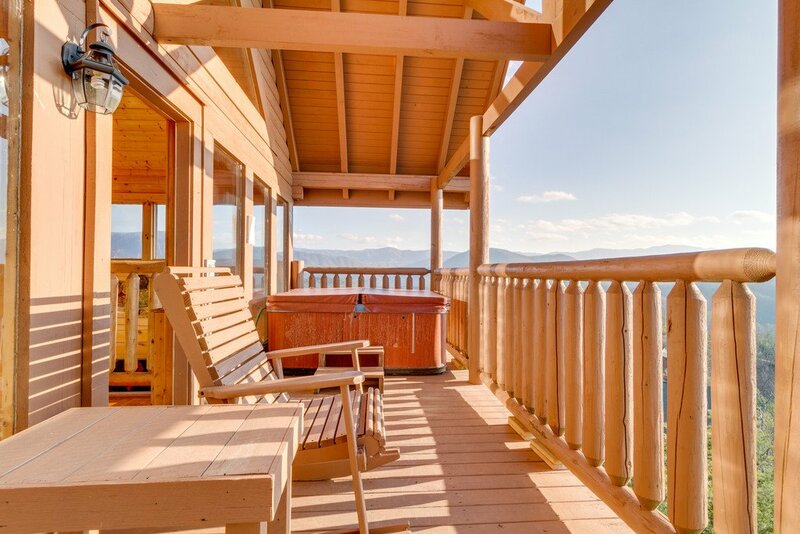 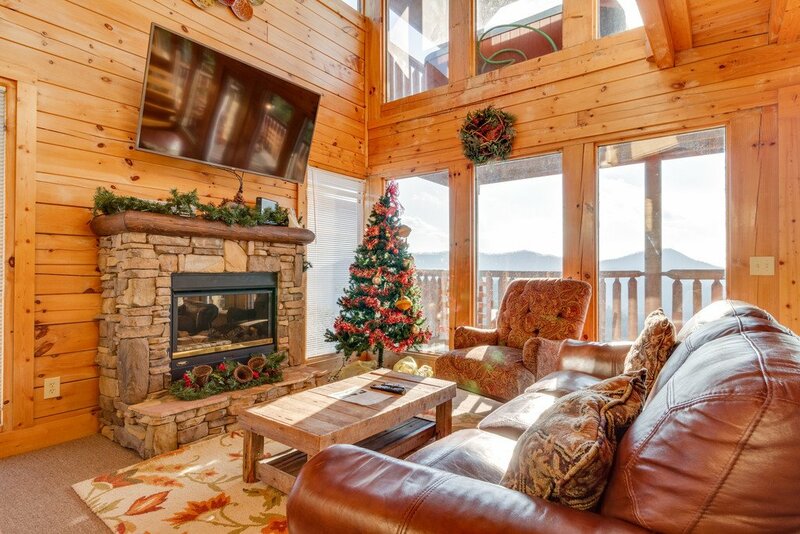 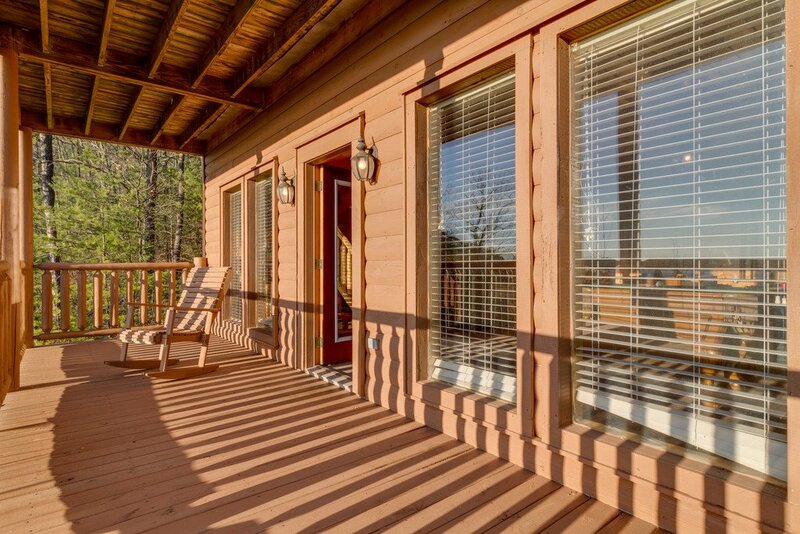 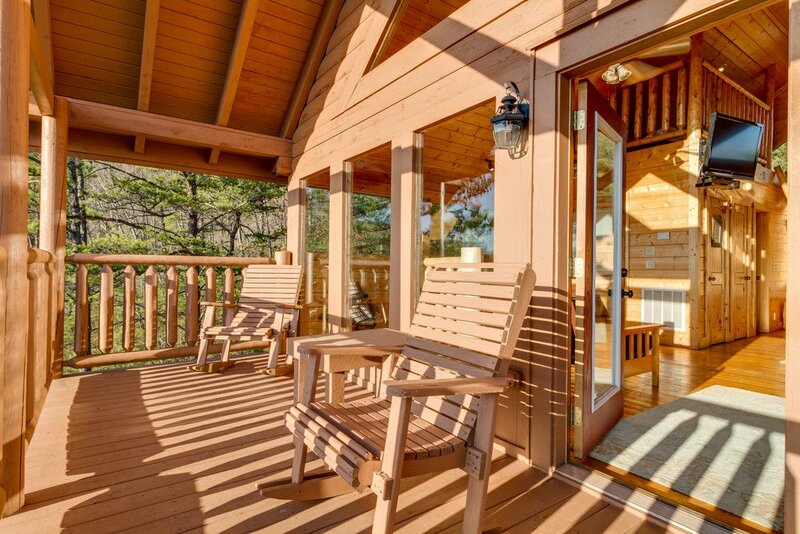 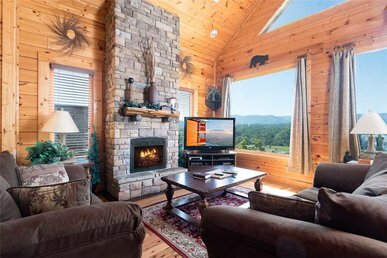 This cabin was designed to showcase the expansive views and allow guests to relax in comfort and Smoky Mountain style. 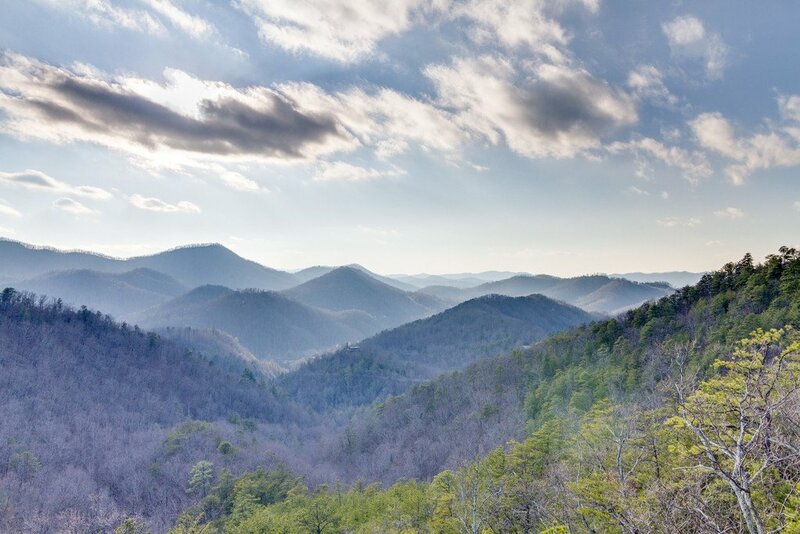 When you pull up to 50 Mile View, you will instantly understand the name! 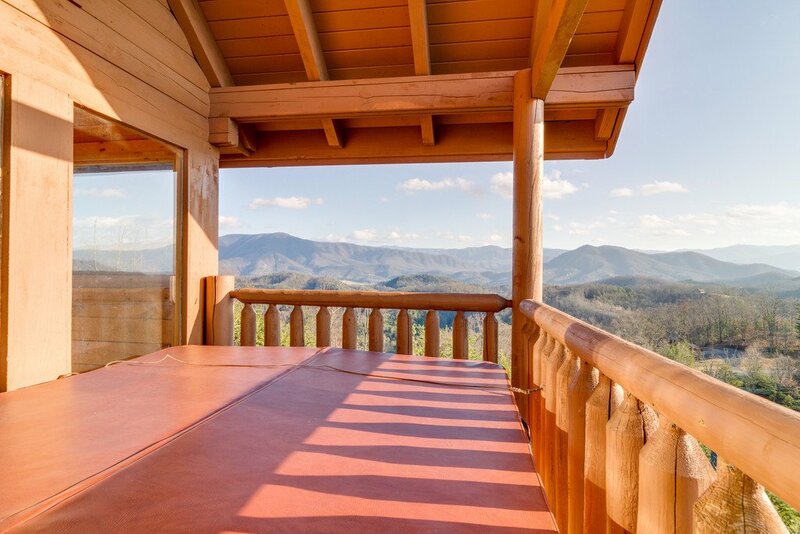 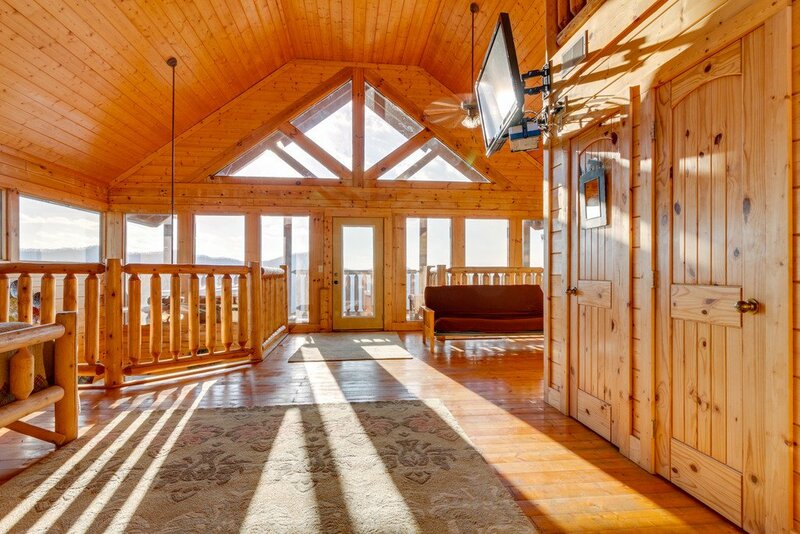 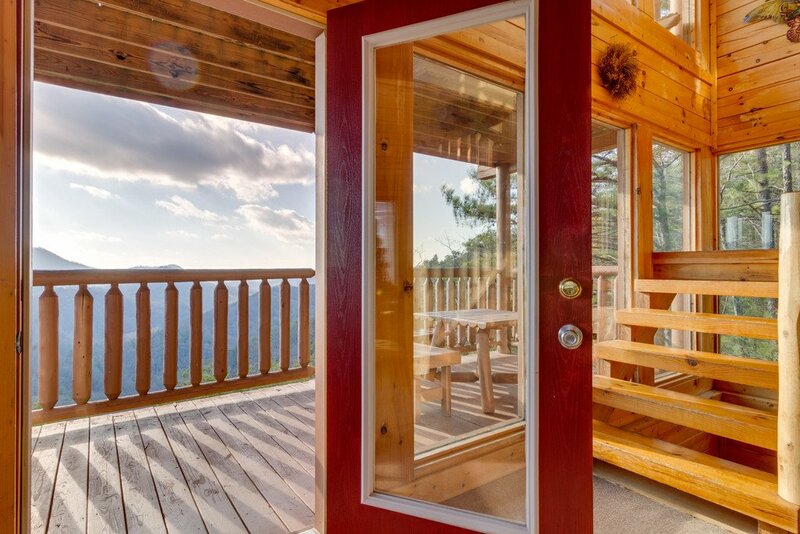 The mountain views from this property are truly enchanting. 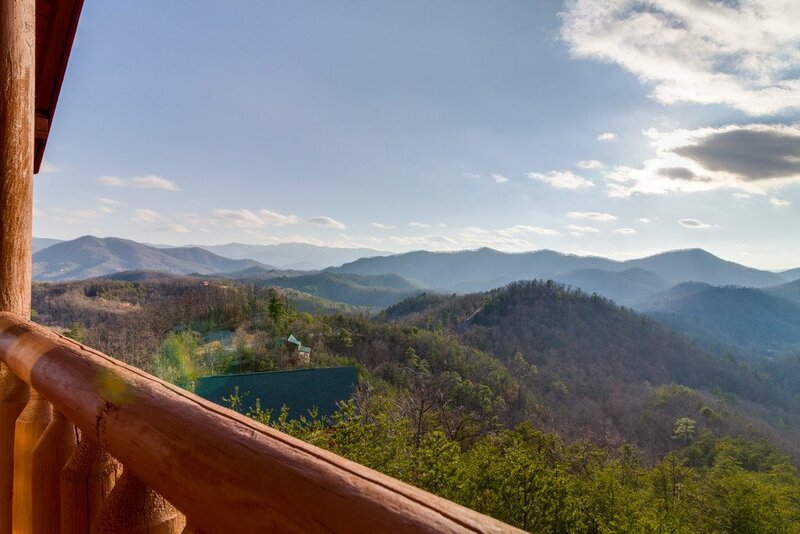 When you walk in, you will immediately enjoy floor to ceiling windows and gorgeous views of the Smokies. 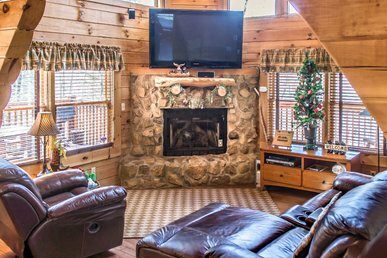 The leather furniture in the living room invites you to relax by the stone fireplace. 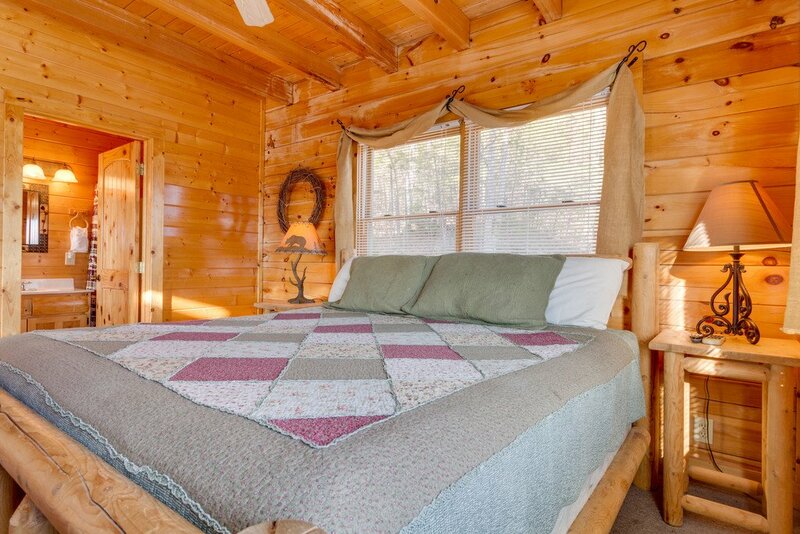 The couch pulls out to sleep extra guests. 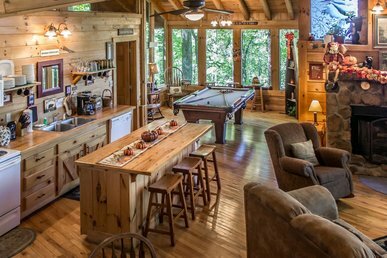 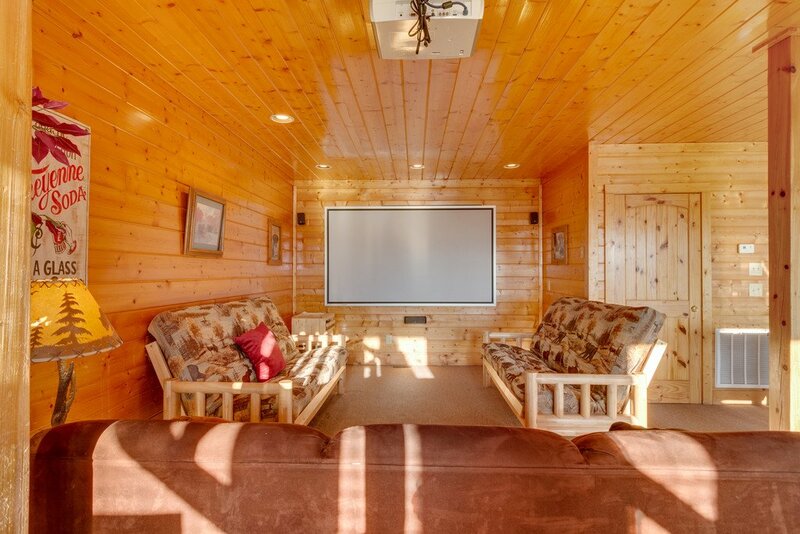 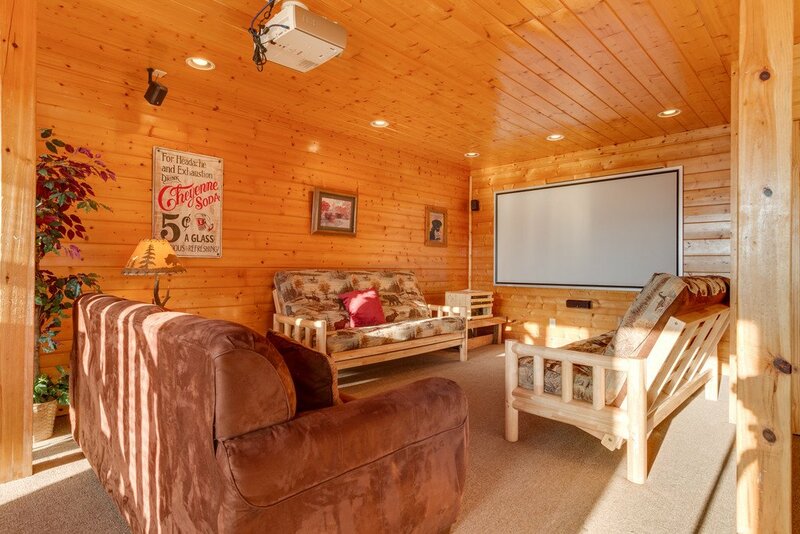 The main level also includes a full kitchen, large flat screen TV, dining area, and a large deck with rocking chairs and an outdoor eating area. 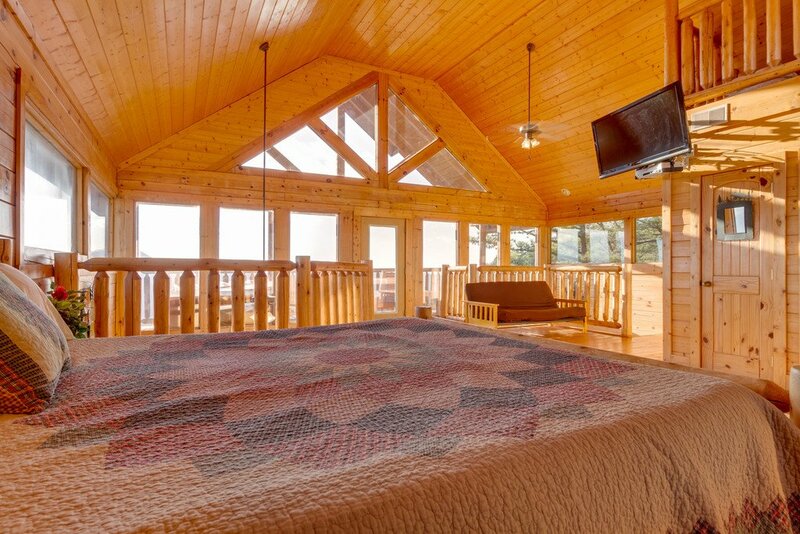 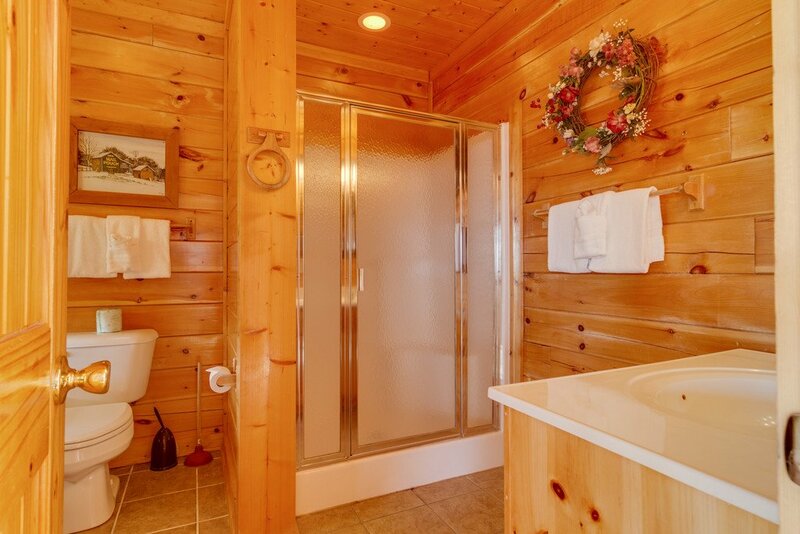 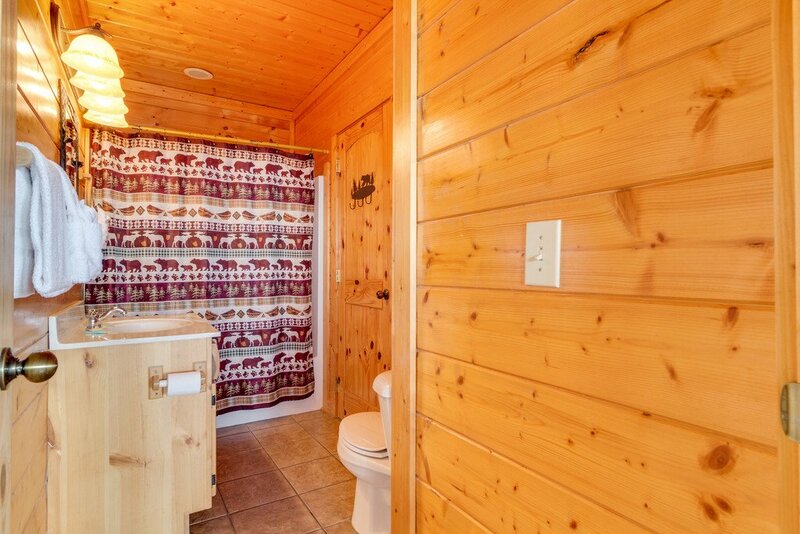 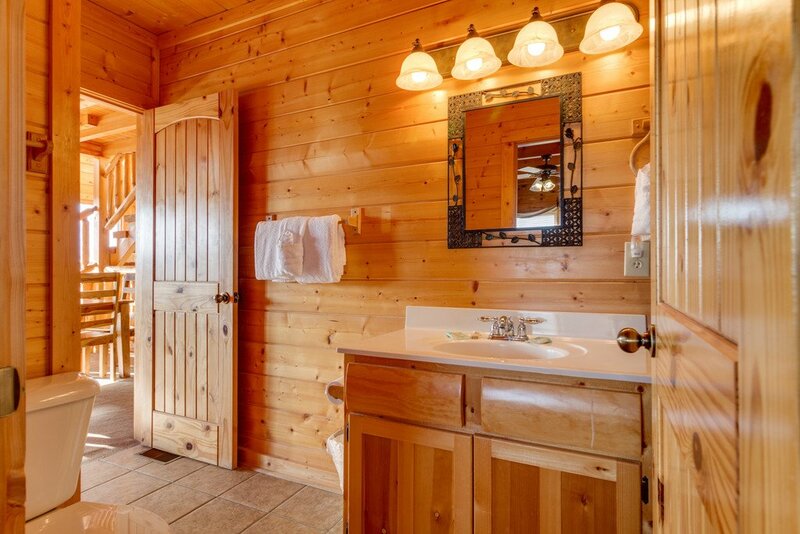 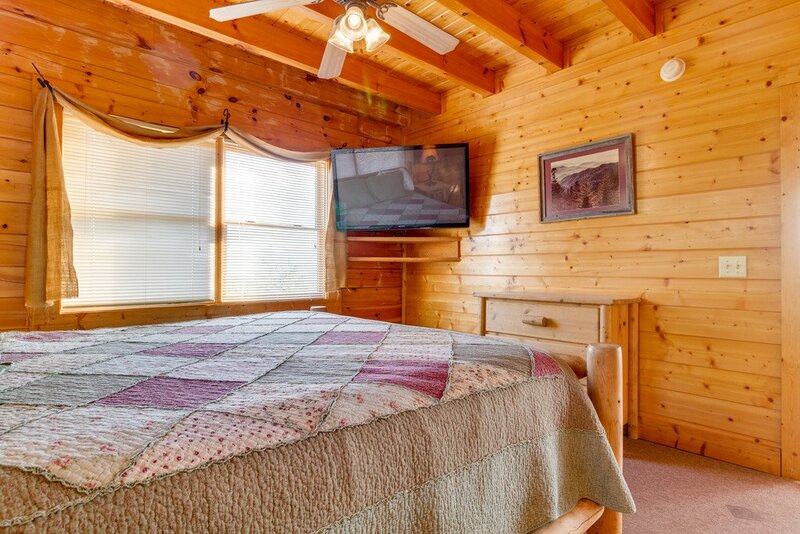 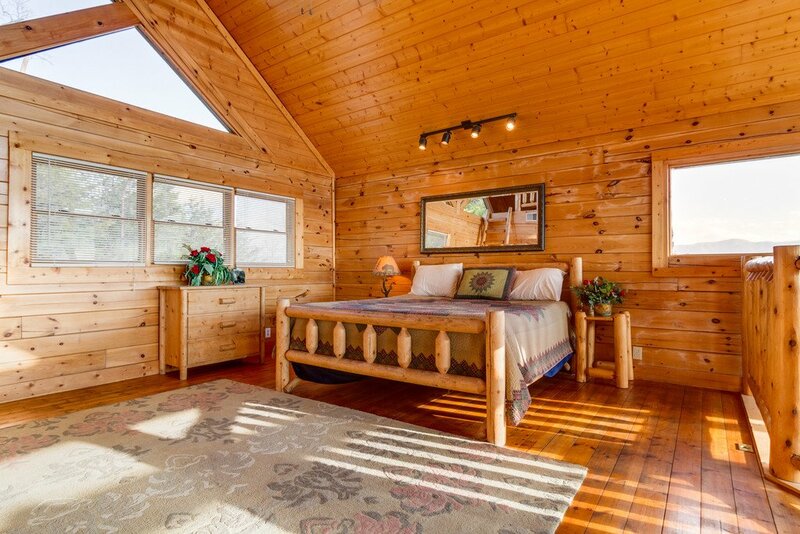 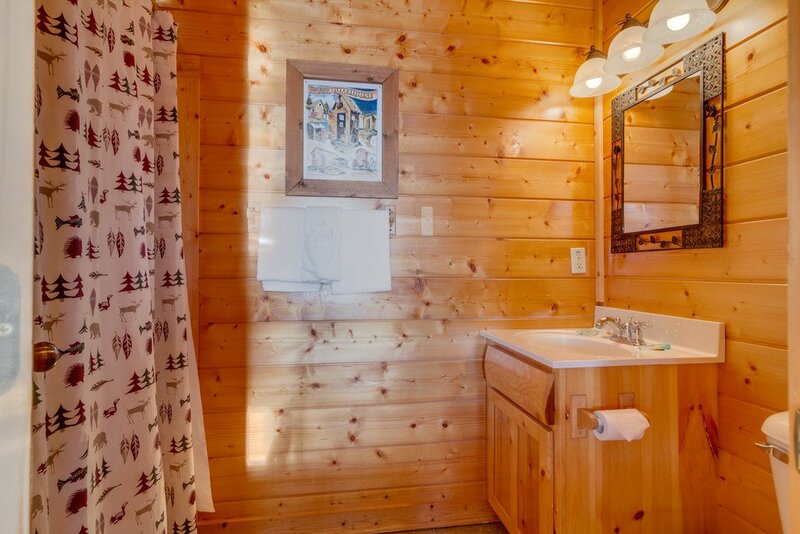 Also on the main level is a bedroom with an aspen log king sized bed and access to a full bath. 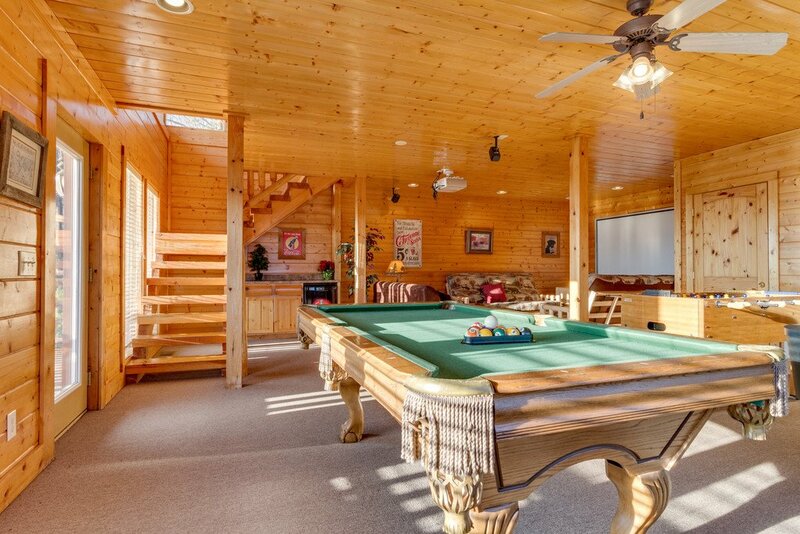 The lower level is all out entertainment. 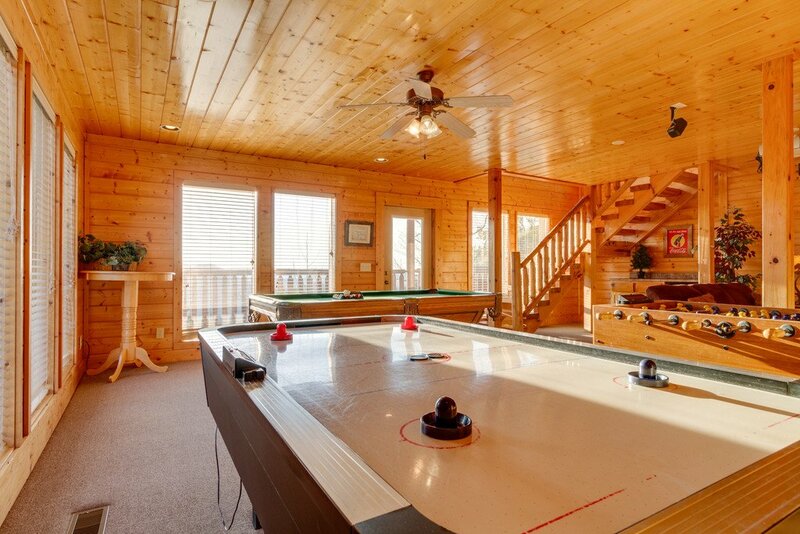 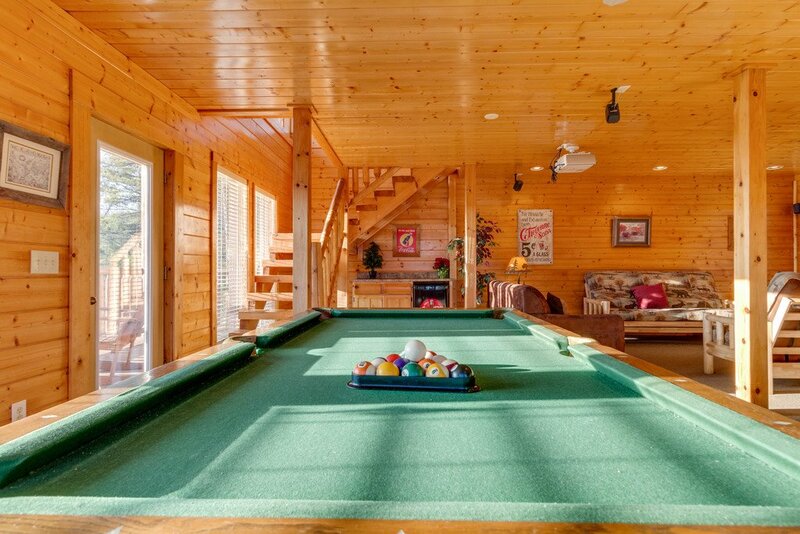 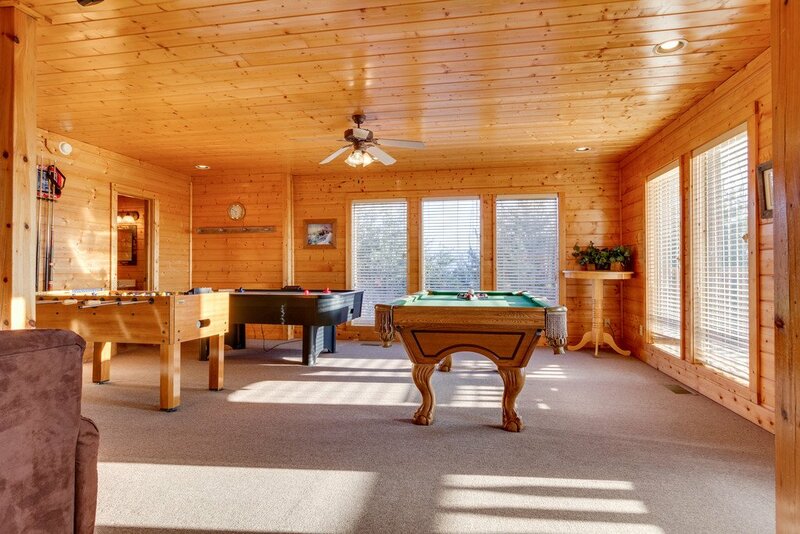 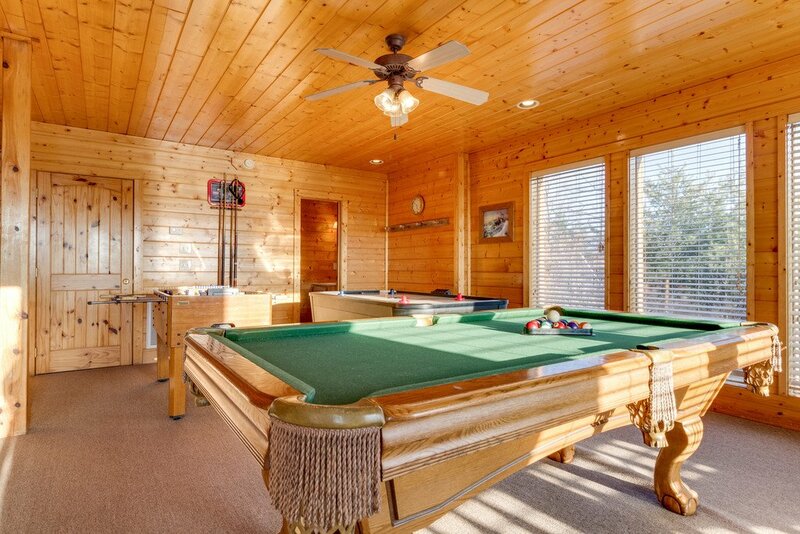 At the bottom of the beautiful open wood staircase are a pool table, air hockey table, foosball, game table, and wet bar! 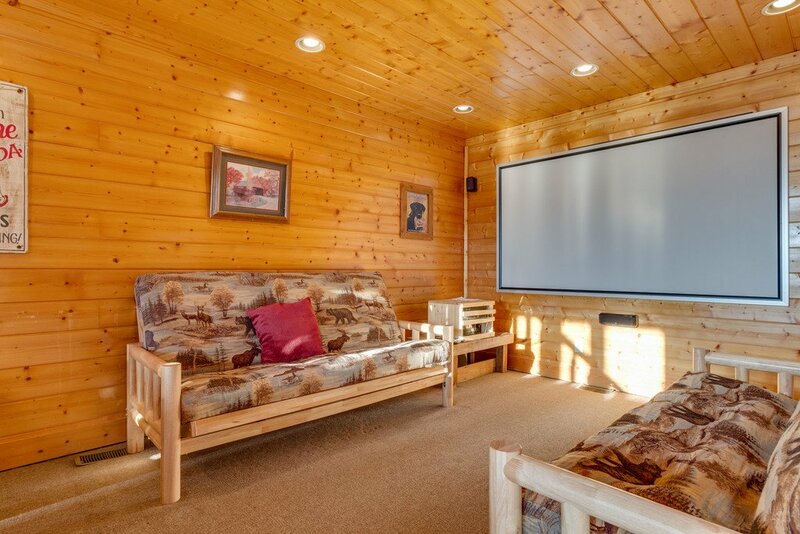 Bring along your favorite Blu-Ray and DVD’s to enjoy the theater room, complete with 105-inch screen, 1080p projector and Surround Sound as well as comfortable seating. 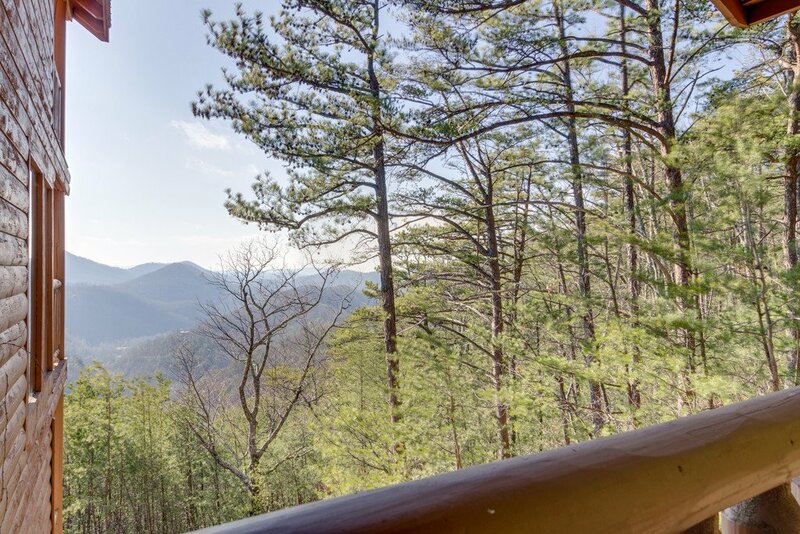 The amazing views continue from this level with a full deck. 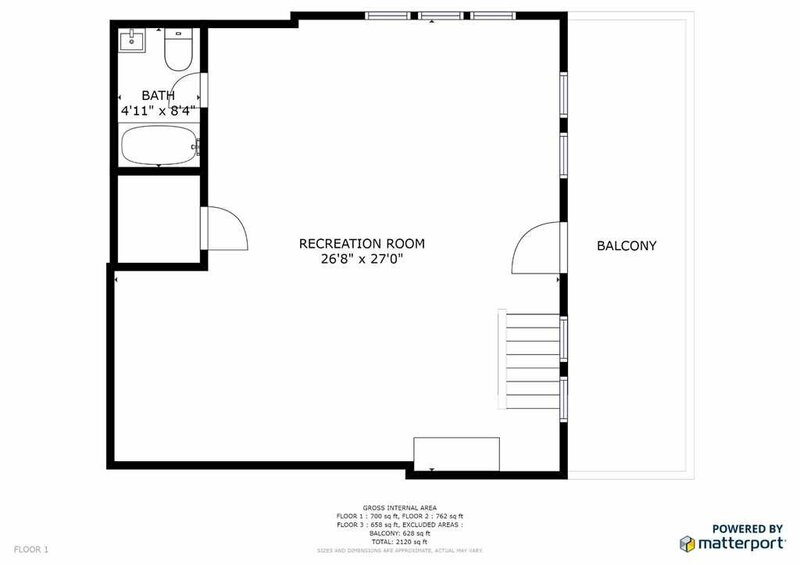 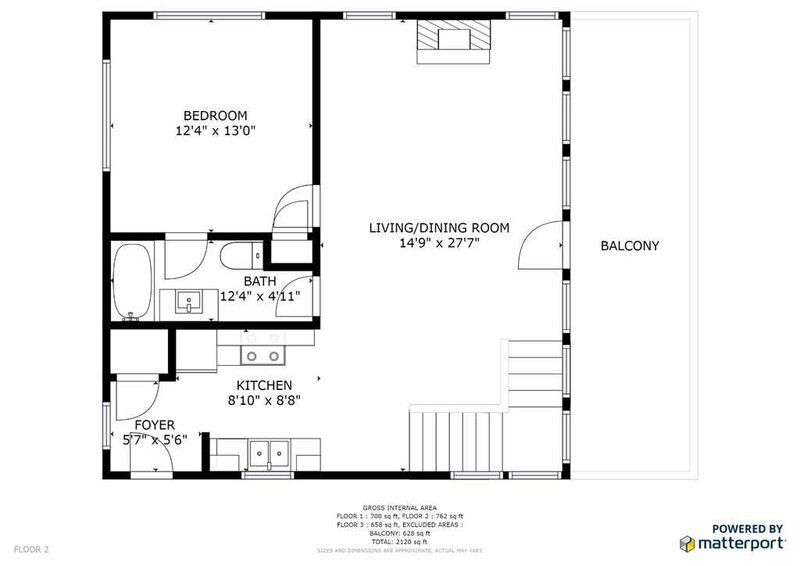 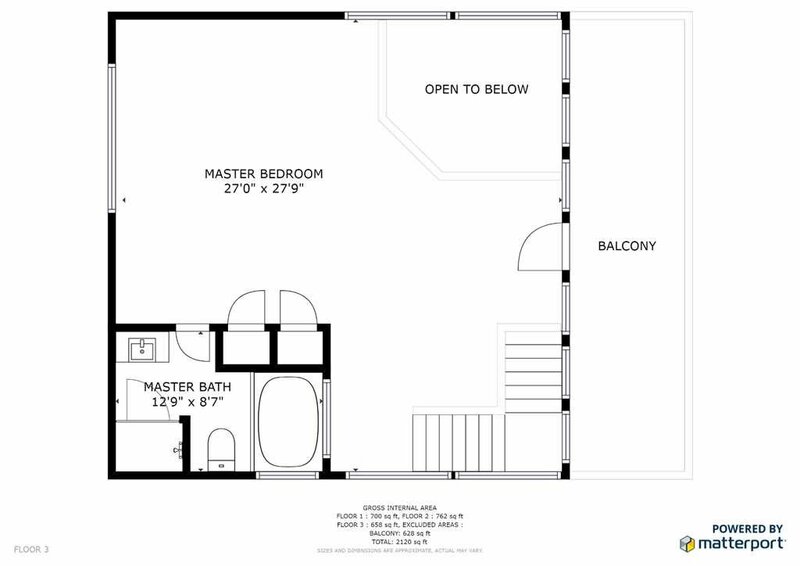 There is also a full bathroom on the lower level as well as a pull out queen sofa bed and two full size futons. 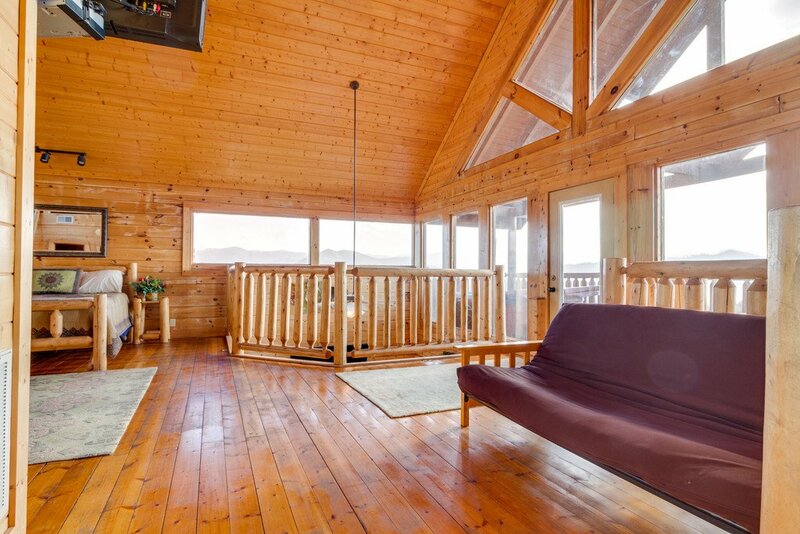 The view moves with you through the expansive windows as you travel to the upper level. 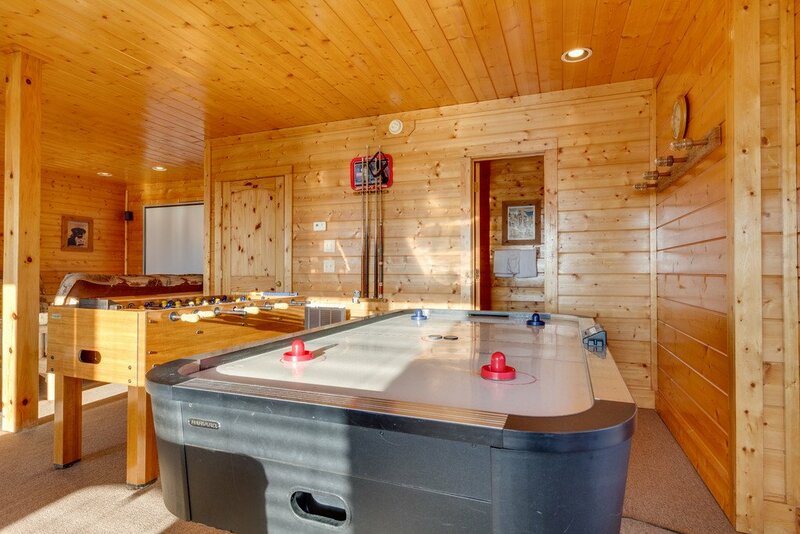 This level features a third deck with a private hot tub and outdoor seating. 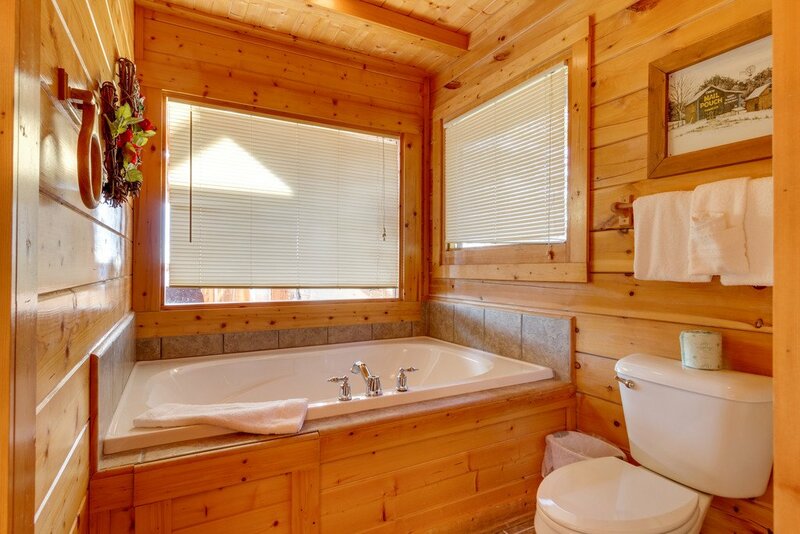 There is a king bed, full bathroom with a large jetted tub and a shower stall. 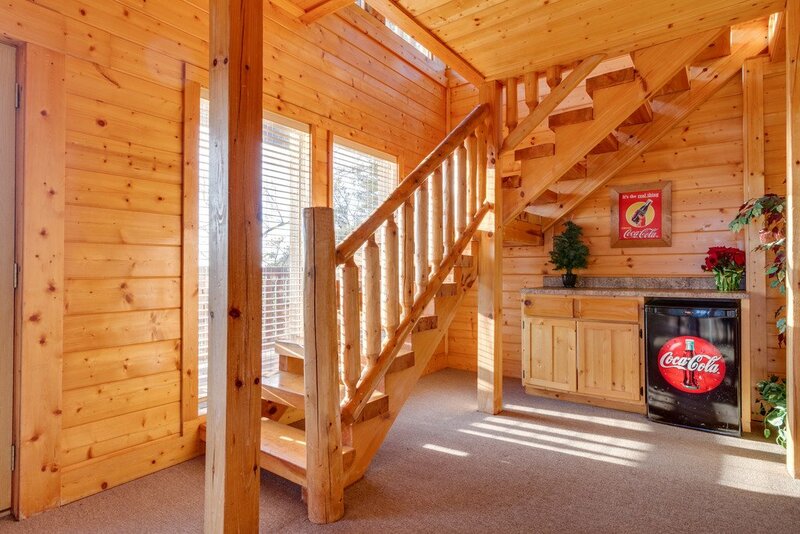 A short climb up the wooden ladder and you arrive at the crow's nest which has two full futon mattress for additional sleeping space. 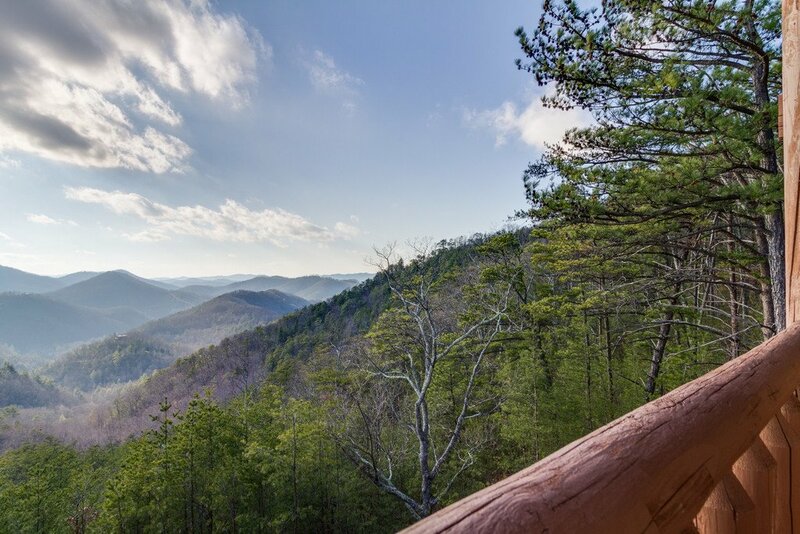 There is parking available for up to 6 vehicles. 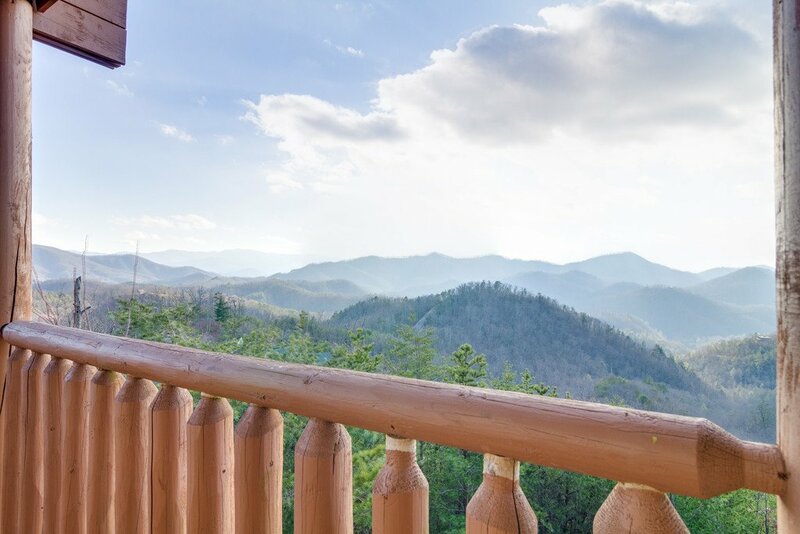 50 Mile View is everything you have been looking for in a Smoky Mountain getaway. 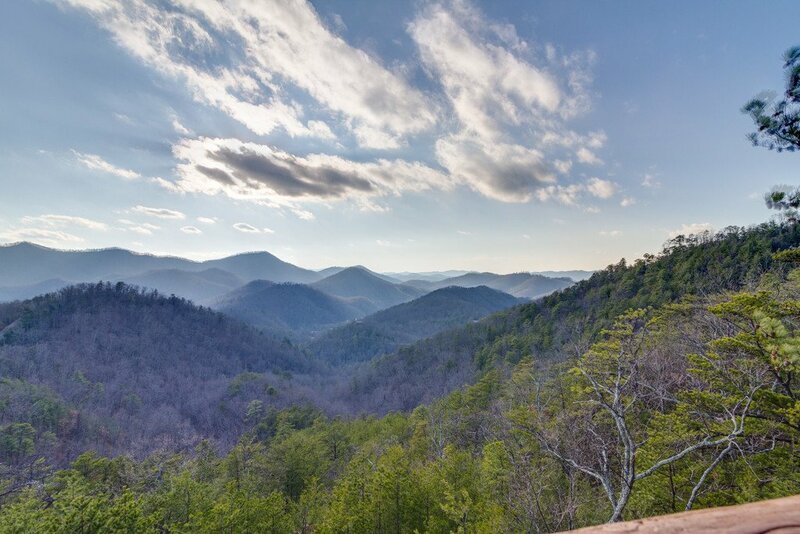 Just down the road a piece is the quintessential town of Townsend considered the “peaceful side of the Smokies”. 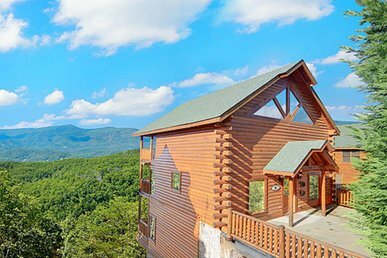 You are also just a short ride over to Pigeon Forge and all of the amazing activities, shopping, and food that it has to offer.